Soon after the last glacier receded north, humans began to move into the Kankakee Valley. We do not know what tribes these prehistoric people later evolved into. Today two main Indian tribes are associated with Kankakee Marsh history—the Miamis and Potawatomi. Both tribes were pushed into the Kankakee Marsh because of Iroquois pressure. In the 1670s the Miami began migrating from the Fox River area in Wisconsin southeastward towards the St. Joseph-Kankakee Rivers portage. The first recorded encounter, in around 1675, with western man was with French priest Father Allouez. The Miami were the dominant tribe in the St. Joseph River and Kankakee Marsh area until the Potawatomi took the lead. In the early 1600s the Potawatomi occupied northern Michigan. Soon the fierce Iroquois Confederation expansion threatened them. By the mid-1600s the Potawatomi had moved to northern Wisconsin. The Algonquin Tribe eventually pushed the Iroquois back to New York. The Algonquin then put pressure on the Potawatomi to continue moving south along the western Lake Michigan shore. By the early to mid 1700s the Potawatomi lived in northern Illinois and Indiana, and southern portions of Wisconsin and Michigan. The Potawatomi consisted of a number of bands, with the Kankakee Marsh controlled by the Kankakee River Band. 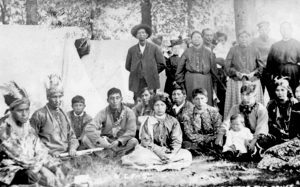 There were other tribes in the Kankakee River area. The occupation of the marsh was actively evolving until the early 1700s when the Potawatomi took control. France was the dominant European power in the region. Much of our information comes from French records. Fort St. Joseph was an important military, church and trading installation. Father Allouez (1622-1689) was a Jesuit explorer that established the Mission de Saint-Joseph in the 1680s. The French later built a fort there in 1691. The former mission and trading post now became an important French stronghold. It was located near present day Niles, Michigan and controlled southwest Michigan and the entire Kankakee Marsh region. England took possession of France’s New World holdings after their defeat in the French-Indian Wars (1754-1763). English trappers and settlers began to move into the Kankakee Marsh area and later Americans came after England’s defeat in the Revolutionary War. Although, the English were required to leave the Northwest Territories, they continued to keep a military presence and instigated conflict between the Indians and Americans. There were many skirmishes between American and English paramilitary. Both sides used the Indians as pawns. After England’s defeat in the War of 1812 a peace-of-sorts came to the Kankakee. However, America was expanding west and the Indians were seen as a nuisance, slowing its growth. Treaties were signed between the United States and the Indian tribes. In 1838 the last of the Indians were to be removed west of the Mississippi. The Indian removal is a blemish on our country that I will address further in future columns.